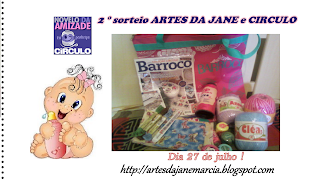 Artes da Jane: Segundo sorteio da Círculo com Artes da Jane ! 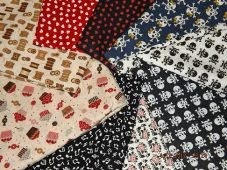 Estou dando início a mais um sorteio com a CÍRCULO, o segundo aqui no meu blog! Vem correndo para ganhar essa sacola com seus produtos! Vamos as regrinhas, para vocês começarem a se inscreverem! Não vou complicar não, tudo muito simples! O sorteio será dia 27 de julho, mais só aceitarei comentário até dia 25 ! Continuem nos acompanhando, as novidades e receitas da CÍRCULO ! Oi Jane sou a 1ª da lista do seu sorteio rsrsrs. Adorava que essa bolsa viesse para Portugal ... será ???!!!! Divulgado na lateral do blog em "Sorteios na Internet"
Vamos mais uma vez tentar a sorte. 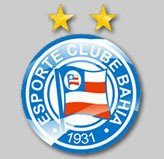 participando e com muito pensamento positivo para ganhar essa linda bolsa da circulo!!! Já estou te seguindo e também participando do sorteio, tá. 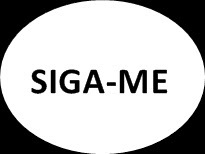 Aproveito pra convidá-la a conhecer o meu cantinho e tbm se inscrever para o sorteio do 1° niver dele. Seá um prazer recebê-la e estarei te esperando. link divulgação: lateral do blog. 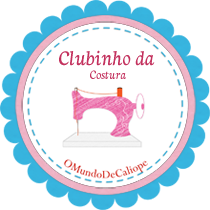 Olá Jane euzinha novamente aqui louquinha para ganhar essa sacola,já faço parte desse cantinho maravilhoso,divulguei na barra lateral do meu blog,bjuss! Oi. Meu nome é Ana e gostaria de participar do sorteio. E-mail: anamaria_santos1@hotmail.com. Vou divulgar também, no Face. oi olha eu aqui é vespera do meu niver quem sabe eu não ganhei sorte para mim rsrsrs! bjs obrigada por essa oportunidade! ja estou seguindo o blog. Participando, torcendo e divulgando na lateral do meu blog, ok? Lindo seu blog, tbém faço ponto cruz,e é um trabalho apaixonante. sou sua seguidora e meu nome de seguidora é "Paaiso". Oi sou a Márcia Regina eu quero. 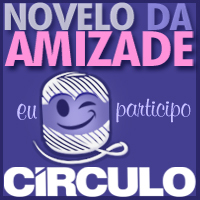 Quero participar! !já sou sua seguidora a tempo! Muito lindo o seu blog!! parabéns! Oi Jane que sorteio lindo, adoraria ganhar!!! Obrigada pela oportunidade de participar do seu sorteio. Divulguei em meu blog, lateral. Divulgando na lateral do meu blog. Oi, Jane! Quero participar também! Colei na lateral do meu blog. E obaaa que tem sorteio!! Eu amei o prêmio e não poderia deixar de participar. NOSSA!!! AINDA NÃO ESTOU NESSE , NÃO POSSO FICAR DE FORA..
Oi, estou aqui tbém!! muito bom esse sorteio!!! Divulguei no face e por email! Parabens pelo blog, tambem quero participar do sorteio. OLÁ EU TBM QUERO PARTICIPAR ! Ando tão atarefada que já ia deixando passar esse sorteio joia. Conto com a sorte de iniciante! Gostaria de participar do sorteio também. Sou sua seguidora. Publiquei o sorteio em meu blog,na lateral. Olá Jane, é um prazer participar do sorteio,espero que eu seja a sortuda da vez! Fazendo uma visitinha pra conferir as novidades e aproveitando participando do soteio! Bjs! Divulgado no meu blog, no FaceBook e no Google+. Tomara que eu ganhe rsrsrs. boa sorte a todas bjoks!! cada dia parabens e sucesso para vc abracos. cidade curitiba-estado parana abracos e estou torcendo os dedos abracos e parabens pelo seu talento DEUS TE PROTEJA HJ E SEMPRE. Apaixonada por lãs e linhas!!! Nem divulguei no blog e face...já que esta encerada . fica pra próxima. Você já fez o sorteio? This page really has all of the information and facts I needed about this subject and didn't know who to ask. such a perfect way? I've a mission that I am just now operating on, and I have been at the look out for such info. RSS feeds, so when I have time I will be back to read more, Please do keep up the great work. Heya i'm for the first time here. I came across this board and I find It truly useful & it helped me out a lot. I hope to give something back and aid others like you helped me. It is really a nice and useful piece of information. I'm satisfied that you simply shared this useful information with us. Please stay us informed like this. Thank you for sharing. clever work and exposure! Keep up the superb works guys I've added you guys to blogroll. Thanks so much and I'm looking forward to touch you. Will you kindly drop me a e-mail? work? I am brand new to running a blog but I do write in my diary on a daily basis. I'd like to start a blog so I can share my own experience and views online. Please let me know if you have any kind of suggestions or tips for new aspiring bloggers. Thankyou! early hours in the dawn, because i love to find out more and more. What's up to all, how is everything, I think every one is getting more from this web site, and your views are pleasant for new people. this weblog offers feature based posts. They will was also player/coach for Draci of the Czech Baseball Extraliga from 2009-11. This is where visit operators and broker agents publish their best prices. Dimensions are actually distinct much like essentials. The other most in-demand add-on is some Grand Canyon Windshield Bridge. at coaching these items towards it. They work intently with you into face-to-face, telephone, e-mail etc. Is usually not&nbsplike therapy even you just series up (or check in) and speak to. They must empower you to the best the life possible. Public transit tour from Las vegas, nevada to the Western world Rim is merely two. 5 hours. It is the situation with the best possible views and the most impressive lookouts. 15 years (South Rim). There, 4,000 shoe beneath you is simply the mighty Denver River! air forefoot that is clair. However the bigger applications stay cooler further. Simply product is of top quality but not with high price? Be very cautious nearly who you situation on your be the owner of with. always been the wife of a Dallas Mavericks tots Mark Cuban. Plusle are mostly another shade of solution with red accentuations. approach to improve your credit. This greatly influenced the aroma market in the american. Employing a credit counselor may make it easier to you learn to make sure you price range all your money. Standing incense burners is also commonly used in Churches. they had to drive. A persons vision color of the type of Chantilly cat may gold yellow emerald. are numerous types for babies, though the very top with the favorites list include:. So you will get that shoes, clothes, even bags for the kids has are more exquisite than before. wear them in summer they will not likely overheat your foot. Whats up! I simply wish to give an enormous thumbs up for the nice information you have got right here on this post. may have right here on this post. I shall be coming again to your blog for extra soon. good data you have got right here on this post. I will be coming back to your blog for extra soon. It is declared at some rule places, kids have into labour. Estou participando. Nome de seguidora: Nabila Araujo. 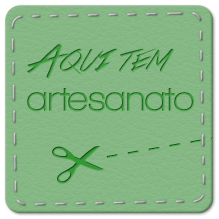 Meu e-mail: (atelieTPNQMF@hotmail.com). OBRIGADA!